The winter months bring weather that may resemble a beautiful snow globe, but in reality, the cold temperatures can be very dangerous if precautions are not taken. For instance, icicles that form on your roof and garage can become sharp and potentially fall and hurt someone if not removed properly. There are a number of ways you can protect your garage from melting snow and ice build up that forms due to the cold weather spreading across Illinois. Make sure your garage is clean: It is important that the floor is clear of any sort of water spills as it may freeze during the cold winter months. 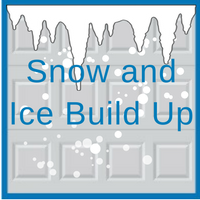 Once your garage is clean, check to see if there are any cracks or openings that cold air or snow may leak through. Seal your floor and door: Sealing your garage floor and door will help prevent melted snow and salt from affecting your concrete floor. There are sealants that prevent damage to your floor as well. If your floors are ready for the winter, the sealer can be applied just to add a shiny look to your garage floor as well. Once you have cleared out your garage and repaired any cracks, it is time to gather the materials you will need to maintain a safe garage during the winter months. Snow rake: You can use a snow rake to remove excess snow from the roof and knock down any icicles that have formed. This is a simple way to clear off any potentially harmful ice on your garage. Use a fan: Aim the fan either at your roof or rain gutters and the existing icicles will slowly melt. The airflow will prevent future icicles from forming. Heat tape: The tape is made of copper wiring which can help prevent any ice buildup from occurring. This can be installed before a big snow storm or cold temperatures hit. You place the tape inside your gutters at the edge of your roof and then turn the tape on when needed. Clear your gutters and roof from snow/ice: It is beneficial to keep up with the safety of your roof by removing ice and snow each time there is a winter storm. It is important to stay on top of protecting your home and garage during winter so that you can stay safe and warm this season. At Blue Sky Builders, our team of garage experts is always here to help with any garage-related project. Call 630-852-8485 or visit Blue Sky Builders online to talk with us about your next garage related project. We are here to help.